On Matt’s birthday we made chocolate cake. Whilst it was baking in the oven we talked about our late break holiday that my Dad had booked us all on to Paris, France. It was only a one hour flight from Manchester and it was somewhere that Matt, Tom and I had always wanted to visit. We were looking forward to seeing all the sights and with a bit of luck some sunny weather was predicted. 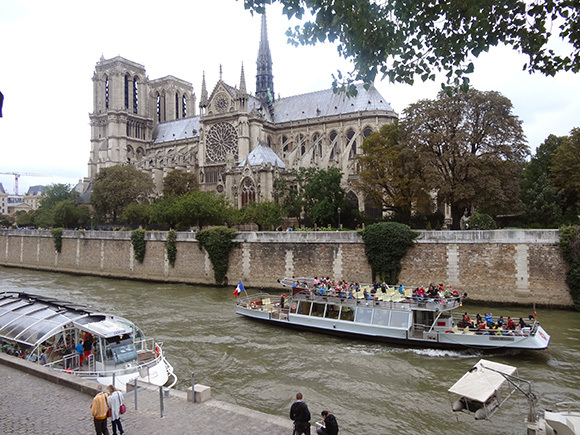 We arrived in the early evening so we decided our first foray into Paris would be along the River Seine to see Notre Dame Cathedral. 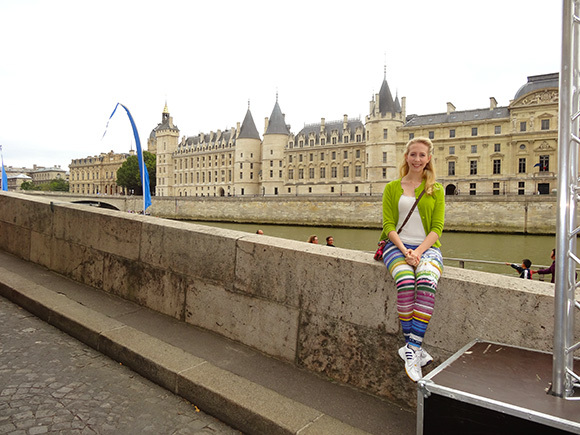 The views along the banks of the Seine were exquisitely beautiful and it made for a fabulous first evening in Paris. 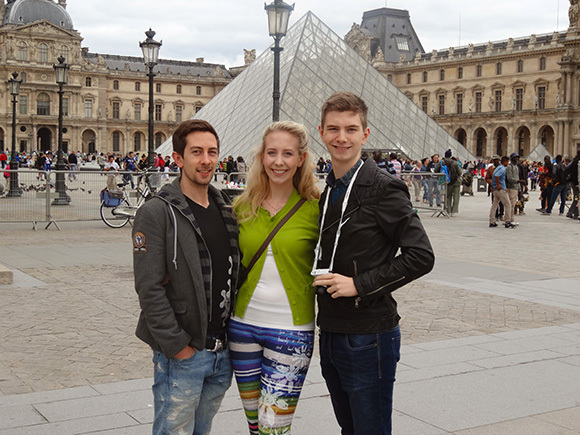 Outside “The Louvre” with my lovely brothers. In the “Square Jean XXIII” where small concerts are often performed. Lover’s padlocks on the “Pont de L’Archeveche”. Just taking 5 minutes before heading back to the hotel. River boat cruises are very popular. We saw Graffiti on the tops of buildings and you have to ask “How” and “Why”. Intriguing, does anybody know what this is ? 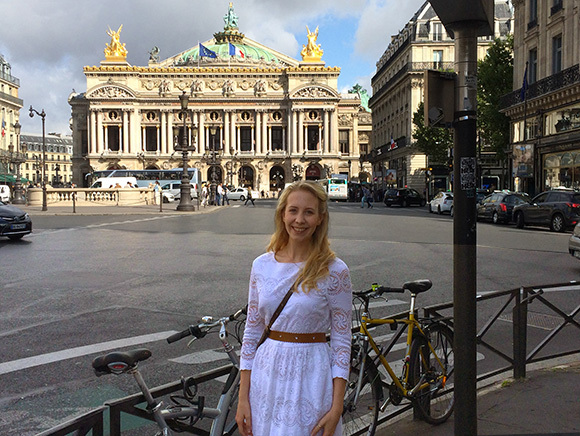 We visited the “Opera National de Paris” later in the week. We saw it when we first arrived and I’ll tell you more about it in my next post. Such a lovely and colorful post. I must say your pants are “out of sight”. Thanks John, our Matt is quite a good cook, it was him guiding me, gorgeous cake. The Art Club Gallery near the Louvre was fabulous some great pieces and paintings, we walked past most days being tempted. Beautiful City, very much taken over by tourists in August. Our taxi driver told us that our 40 minute journey to the hotel would take up to 2 hours 30 minutes in September. Wow – what a lovely treat! You made the best of it, obviously. We didn’t stop from the minute we left the hotel each day until we returned. We walk everywhere and sometimes forget about the length of the journey back! Ha ha good thing Mum took blister plasters on our walk to the Eiffel Tower :). A case of going away for a rest and then coming home for a rest from the rest! Fabulous, it’s a long journey for you :). The main sites won’t be so packed busy in October. Save up because the fashion shopping is brilliant, we only had one full day shopping, that was as much as the boys would take. I’m afraid I’m with the boys on that one, shopping is one of my least favourite activities. But I will be away two months, so I may need to travel light and buy suitable clothes while I am away. It was a nice break for him, he’s studying again for his business qualifications from today. My younger brother took 645 photographs so I had plenty to choose from :). I love Paris. A lovely tour, thank-you! The culture is very different, much slower paced in cafés and restaurants which was nice. Quite expensive though much more so than London. Happy Birthday. That was a very nice birthday present! Matts birthday is the day after Mums so we usually go away for a few days around then usually to London but Dad wanted a change this year. 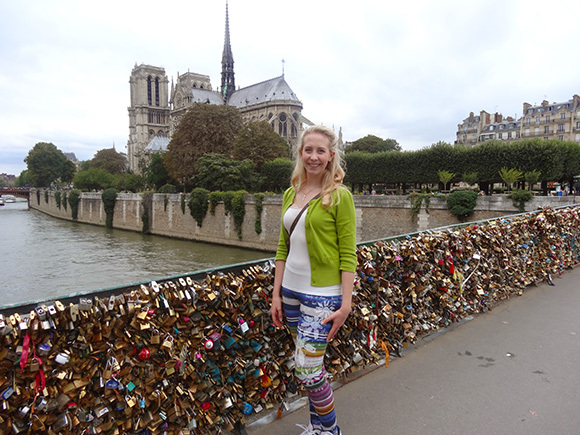 Great photos – looks like you had fun and by the way I LOVE those leggings you were wearing! I love Desigual it’s a Spanish store so always very colourful. The store in Glasgow shut sadly 🙁 . Thanks for sharing. Memories of old . . . Down by the Seine, under the bridges of Paris, all so romantic. Memories to last a lifetime . . . for you too! Thanks Paul, we enjoyed seeing the street entertainment beside the river, false beaches with deck chairs and children making sandcastles, people dancing Salsa, roller blading and skateboarding, even a mini Eiffel Tower made out of red chairs. 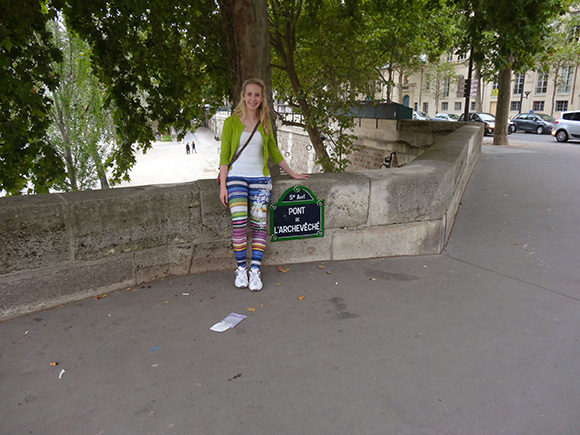 Hi Gill, you must put Paris on your list of places to go you and Terry would love it. Another great post, Charlotte. Thanks. Next time you’re in Paris, ‘Shakespeare & Company’ on the opposite bank of the Seine from Notre-Dame is an amazing place. If your voice can risk all those dusty books it’s well worth a quick (or long) look. Hope you’ve had a nice summer. Back to your studies soon? Thanks Marcus, I’ll remember that for my next visit. I think the aeroplane journeys are the worst things for throats both drying out and when someone nearby coughs the whole trip :). I can’t believe there’s only three weeks of the summer break left, I’m really looking forward to starting my third year. Hope you’ve had a great summer too. You would love it Linda with your eye for photography, so much to see and culture to soak up :). 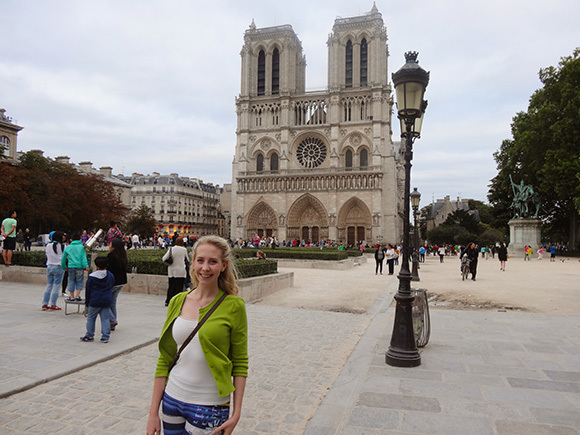 I just realized, I haven’t been to Paris in nearly 3 years (if you don’t count a couple of layovers in the Charles de Gaulle airport, which isn’t even in Paris anyway). Glad you had a good visit. Maybe next time you’re on my side of the Channel we can meet up? 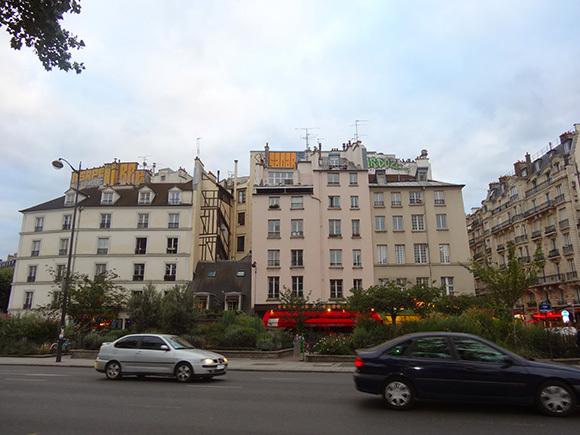 I can take any number of pics of Paris. Great series of photos, there is nothing like having a great family to share time & life with ~ especially in Paris. Cheers! Tom took most of the photos; hopefully he will get to do a photography module in his Geography degree. Luckily we all like similar things and we had a three day weekend to recover and rest from our holiday before going back to work he he. We sampled a different place for breakfast or brunch and evening meal every day, a cabaret club would have been great as lots of the shows didn’t seem to be on in August. I love the pace of the restaurants; Café Ruc was a favourite of mine. 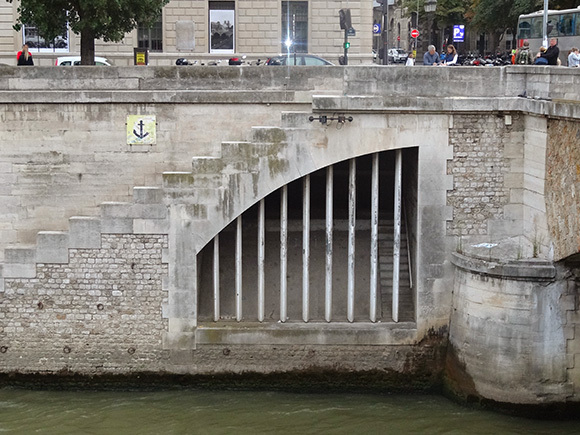 That picture, you questioned, the gate off The Seine, it is an entrance for the Agences de l’Eau.